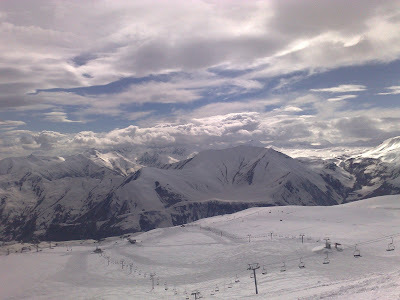 Gudauri, Georgia's main ski resort is an interesting example. It currently is being privatized again, after a previous privatization attempt did not succeed when the investor walked away after a few months, for a range of reasons, including local (they found it difficult to get all the land they needed to consolidate their holdings) and legal (apparently they were sued in a foreign court for a debt incurred by the Shevardnadze government, under an obscure clause). In Gudauri the lifts are bundled together with the main Sport Hotel, as a single entity, a curious late 80s Austrian-Soviet venture. The bundling creates various problems: investments into the lifts may benefit all hotels and guest houses by bringing more visitors, but investment has to be undertaken by a single institution. The other hotels effectively are free riders. This also raises issues at the end of season: now the lifts are beginning to run at a loss, with daily electricity costs about 600 GEL, and personnel costs of about 400 GEL, plus fuel costs for grading the pistes, starting anywhere at 300 GEL per day, depending on the weather. At a price per pass of 25 GEL, more than 60 skiers are needed in the resort, and as last weekend showed, it's barely more than three dozen at this time of year. But: at this time of year, lifts start at nine o'clock (as opposed to ten, earlier in the season) and many people prefer to ski early before it gets too slushy, so that people now are even more likely to stay over, rather than drive up from Tbilisi. A few guest houses are actually full, and thriving. Of course, that money would dry up once the season is over, so the skiing is primarily kept to feed the guesthouses. Yet in the current structure, the lift operator still incurs a loss. Generally, quality of service has seen a huge improvement in the last year, and the main variable is competent new management. But a lot of things still need to fall into place, and in the upcoming privatization one idea is to separate the lifts out, which may even be an option since this year for the first time the llifts have been making a profit. In a way, the resort mirrors many of the intervowen challenges that need to be met (and who to meet them: national government? Local? ), and in which growth typically throws up the next problem, such as the supply of drinking water to all the new buildings.